Radio stations went off the air, and the main line telegraph had stopped working just north of Hiroshima. Chaotic reports of a horrific explosion came from several railway stops close to the city and were transmitted to the Headquarters of the Japanese General Staff. Military headquarters personnel tried to contact the Army Control Station in Hiroshima and were met with complete silence. The Japanese were puzzled. They knew that no large enemy raid could have occurred, and no sizeable store of explosives was in Hiroshima at that time, yet terrible rumors were starting. A young officer of the Japanese General Staff was instructed to fly immediately to Hiroshima, to land, survey the damage and return to Tokyo with reliable information for the staff. Headquarters doubted that anything serious had occurred, but the rumors were building. When the staff officer in his plane was nearly 100 miles (160 km) from Hiroshima, he and his pilot noticed a huge cloud of smoke from the bomb. In the bright afternoon, the remains of Hiroshima were burning. The plane soon reached the city and circled it. A great scar on the land was still burning, covered by a heavy cloud of smoke. 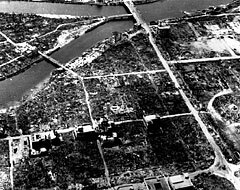 They landed south of Hiroshima, and the staff officer immediately began to organize relief measures, after reporting to Tokyo.